1:41 Crazy Harry is the conductor of the S&P train. He loves to park it in a station and go see a girl. Crazy Harry has a date, seeing his girl at 1178. 1:11 there is a point from the Chaos Trading Made Easy course called the Sleeper Buy Point. We are at it now. 12:54 if you went to a restaurant, and they told you the wait would be several hours, you'd leave. 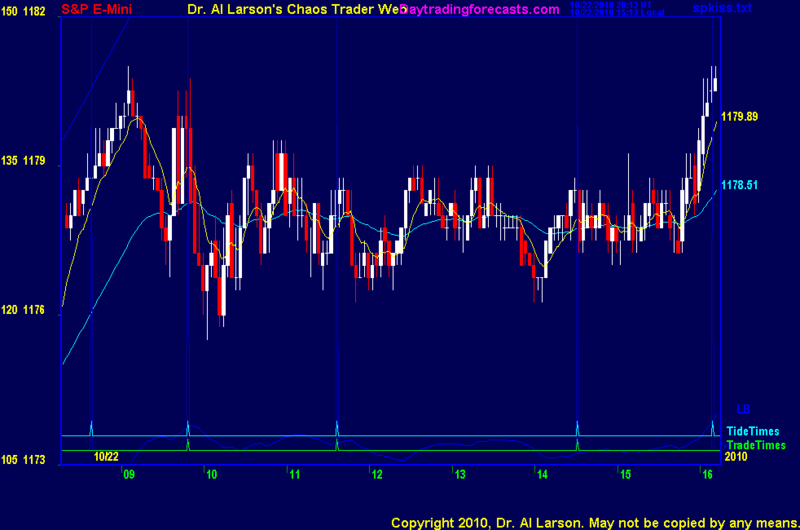 But you shouldn't in markets; the 4th harmonic of the rotating earth is 6 hours, and the 6th is 4 hours. 12:25 my focus is being tested by the crew that showed up this morning to install my new gutters. 11:39 regular MM says today is a "stinker"; I remind everyone that "Chaos Follows Dullness"
11:04 I'm already in the second trade window. I'll just carry this trade through. Taking a breakfast break. 10:26 still holding up; fractal looks OK; this is a good example of the value of overlay patterns. Tell you more than just indicators. 9:26 today is the full Moon. On the SPSunMoonMer chart the Sun flux near 1176 and the Moon flux near 1174.75 are support. 9:18 the MTRainbow chart shows trade above the white 440 minute EXMA, which is sloping up. Bullish outlook for the day. The initial rally stopped at 1181, the price of the Chiron/Mars/Neputune (C,R,N) electric field flux lines on the Chaos Clinic chart. This has been significant resistance for over a week. Today looks like "hold it up" day, with the morning being relatively dull, and a possible late rally. 10/22/2010 12:53:54 PM MT TG****:: your welcome mm. have a good weekend Al, mm, and everyone else. 10/22/2010 12:22:22 PM MT EOE:: we're back to Venus. 10/22/2010 11:46:40 AM MT EOE:: had no idea you were a poet Al. 10/22/2010 11:16:12 AM MT EOE:: therehas been something magical about 1178. we've been hanging around it all day. 10/22/2010 10:15:18 AM MT mm****:: I don't remember: Is it an anniversary of M's passing - or did it happen now ?